From my "Myths and Mermaids" solo show at Pop Gallery at Downtown Disney, here is "Jeweled Octopus". Marine cephalopods - octopus, squid, cuttlefish, etc. are some of my favourite creatures, and I think they are worthy of some fine jewelry now and then! The original painting herself was sold a the show, Limited Edition Canvases are available from Pop Gallery (and Hoypoloi Galleries), other prints & merchandise are available online. Limited Edition Canvas prints are exclusive to Pop Gallery and the Hoypoloi Galleries. You can pick yours out in person, or they are happy to ship worldwide- just call them at 407-827-8200 or email Pop Gallery - the "Jeweled Octopus" Limited Edition Canvases are a big 16"x20" gallery size, deep cradled/gallery wrapped edges, hand embellished by me in acrylic paints, signed & numbered out of 42 ever made, and at $515 each they are truly the next best thing to owning the original. 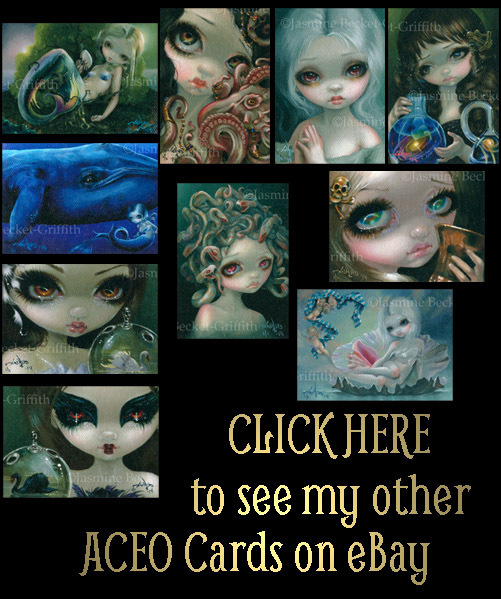 A fabulous way to collect art - particularly if you are budget-minded or lacking in wallspace - these ACEO Cards (an acronym for Art Cards, Editions & Originals) are sold directly by me - the artist! Each one is 2.5"x3.5" - the size of a baseball card, a tiny canvas giclee I have hand accented in paint, signed, dated & numbered #1 of 1 - because I only ever make one ACEO of each painting, ever. Truly one of a kind. Each card is up for an auction starting at just one penny on eBay, ending the evening of Thursday, January 9th at around 6:00pm Central Time. We are more than happy to ship these worldwide. Last Chance - "Amongst the Koi"
Now SOLD OUT - the #25/25 last Lt. Ed. Canvas is up for auction! Yes, she is now all gone except for this final #25 of only 25 ever created - my lovely "Amongst the Koi". Hand embellished by me in acrylic paints, signed, dated & numbered #25/25, this final Limited Edition Canvas print is up for auction on eBay HERE and ends TONIGHT. Bidding started at just a penny, to give everybody one final chance at this beautiful mermaid & her fishy friends. No more Limited Edition Canvases of Amongst the Koi will ever be made. Many other Limited Edition canvases of mine are nearing the sold-out point. The holiday rush really hit us hard this year and stock is dwindling on many of my most popular pieces (as well as some of my older works). If you have a favourite painting you have been keeping an eye out for, I would recommend ordering a Limited Edition Canvas sooner rather than later, because once they are gone - they are gone forever. Limited Edition Canvas prints can be ordered from my website -http://www.strangeling.com (in our Fine Art Prints shop, just click on the painting you'd like, and under the "Fine Art Prints: Choose an Option" dropdown box, select the Canvas option if available). Many can also be purchased from my eBay store in the Limited Edition Canvases section. Pop Gallery Exclusive Canvases are available through Pop Gallery at Disney World in Florida, and WonderGround Gallery Exclusives are available at Disneyland in California. 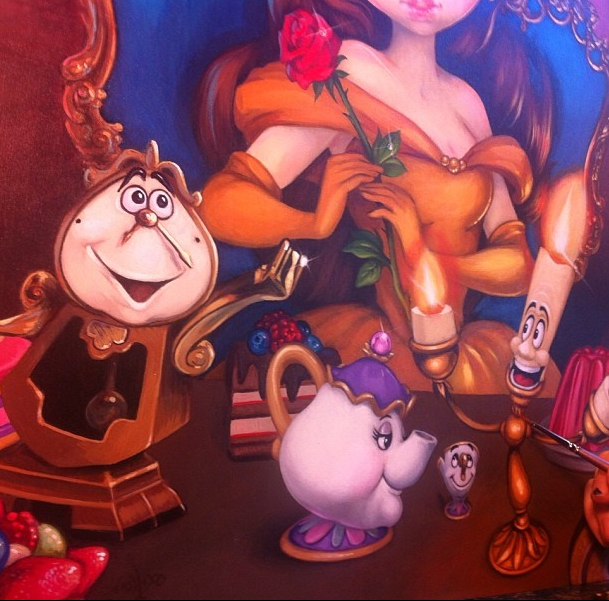 Above is a snippet of a super "sneak peek" for my upcoming Disney painting "Be Our Guest" featuring Princess Belle, Lumiere, Mrs. Potts & more! This painting (and others!) will be debuting at my WonderGround Gallery event at Disneyland on March 1st - I will be there from 11:00am-1:00pm to showcase the new paintings, sign autographs, come say hi! All WonderGround original paintings, prints & merchandise will be EXCLUSIVE to the WonderGround Gallery (either in person, or they will be happy to ship worldwide via telephone order) - I will post more details as I have them. In the meantime, join the Special Event Page for March 1st up at Facebook - click HERE - to stay tuned for details about this painting and more.